you will I am sure have noted that I predicted that in their utterly predictable failure in Stoke they would start to tear their own hear4t out, just as Ukip always has in the past. 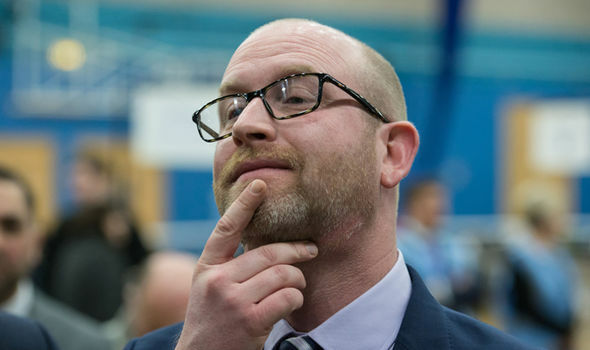 Paul Nuttall can be assured to lack the integrity to admit it was his own abject incompetence and undeniable duplicity and dishonesty backed by incompetent idiots managing his failed campaign that caused Ukip to fail to win in Stoke – most probably the most likely and easiest seat for Ukip to win in the whole UK! Increasingly Ukip confirm they have not got, nor have they ever had or ever will have a rle in British domestic politics – even if they had a single ethical member of any standing to put forward as a candidate it is unlikely they will ever have an MP in Westminster other than the odd turncoat who had established themselves in their constituency and failed within their original party of choice. Such as the tree they have had to date, only one of whom was returned as an MP. DOUGLAS Carswell must be expelled from Ukip or leave the party after his “disgraceful” comments on Question Time, a leading MEP has blasted. Bill Etheridge, Ukip’s MEP for the West Midlands, was scathing in his criticism of the former Tory MP after he called the party’s values and principles into question on the same night Paul Nuttall was fighting a crucial by-election in Stoke-on-Trent Central. Ukip’s defence spokesman also attacked Mr Carswell for his remarks on former party leader Nigel Farage – who was not in Stoke for the by-election count amid rumours of new rifts within the party. Mr Etheridge told the Express.co.uk: “Douglas Carswell’s performance on Question Time was an absolute disgrace. “His criticism of Nigel Farage, and what’s more, his criticism of the values of our party and the smug, smirky manner in which he has done it on a night what is so important to our party is a disgrace. “Frankly, it’s time that action was taken to deal with this kind of behaviour and these kind of comments. 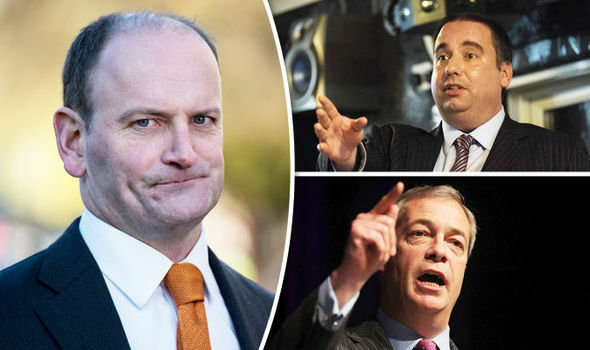 Douglas Carswell labelled Nigel Farage’s unsuccessful campaign in South Thanet as “mayhem” and smirked as he slammed the leading Brexiteer for “representing LBC” rather than Ukip – despite stating he would not “take a dig” at the former leader. 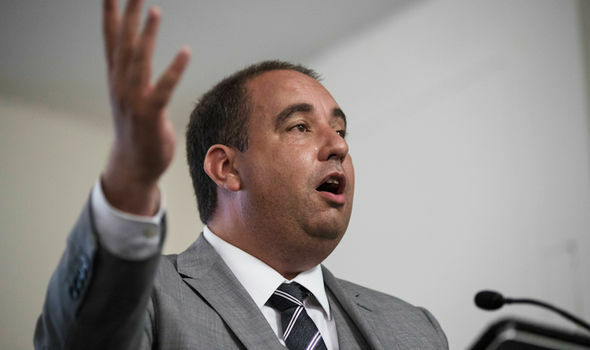 Mr Etheridge took offence to Carswell’s claims that the party does not get the “benefit of the doubt” and that it was time to change the party’s values. He said: “That to me is a disgraceful thing to say. The reason we don’t get the benefit of the doubt is due to smears and attacks by our opponents. “We should be defending our party and be positive about the values we put forward. Brexit: Which parts of the UK had the majority vote? Much of the North East of the United Kingdom voted to leave the European Union including Sunderland, Gateshead, Darlington, Durham, Hartlepool, Middlesbrough, Stockton, Redcar and Cleveland, North Tyneside and South Tyneside, and Northumberland. Newcastle was the only borough to vote to remain. 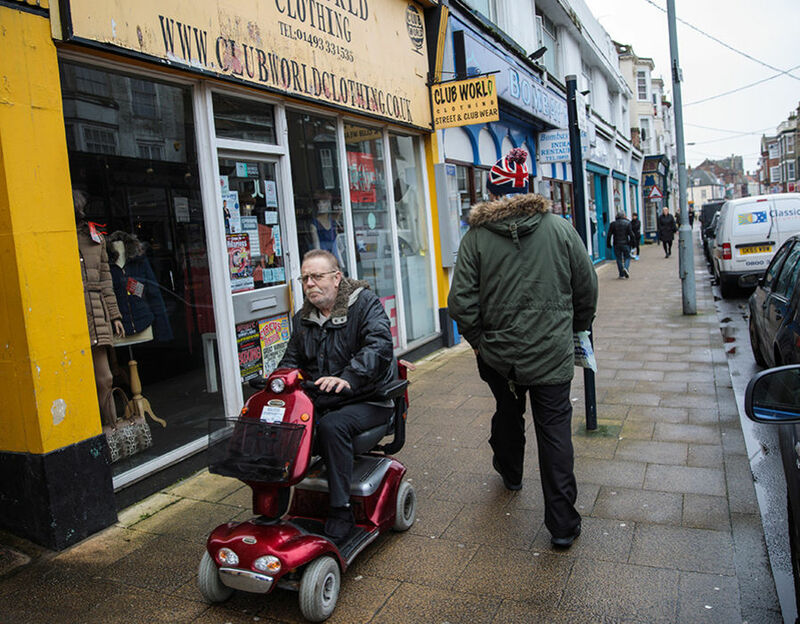 GREAT YARMOUTH: The town of Great Yarmouth on the East Coast of England voted by 72% to leave the European Union. “As Nigel Farage said last week, if Ukip aren’t a radical party, we will amount to nothing… We will not change. “We will continue to be a radical, reforming party who continue to challenge the status quo. Mr Etheridge said he would be taking the matter to the Ukip’s National Executive Committee (NEC) – who would have the power to make the decision to sack Mr Carswell – after receiving support from “grassroots activists and all throughout the party”. Paul Nuttall received a vocal show of support from Mr Etheridge, but he added his campaign in Stoke-on-Trent had “suffered” because of the advice he had received from certain members within the party. The Express.co.uk has contacted Mr Carswell for a response. It took less than twenty-four hours from the moment Paul Nuttall was soundly defeated in Stoke and like clockwork, the infighting and bullying within UKIP had already begun. We predicted as much in our piece published earlier in the week and we’re sure nobody reading this is really surprised. The target this time is someone who is well used to being attacked by his own side and in true UKIP fashion, their one electable and somewhat moderate MP, Douglas Carswell, is facing calls for his expulsion from Bill Etheridge after he made “disgraceful statements” on BBC Question Time last night. Perhaps Carswell made racist comments or endorsed torture. Maybe he posted false statements about his presence at a disastrous and tragic event. Or did he make multiple sexual harassment calls to women while employed as an adviser to the party? No he did much, much worse. The Clacton MP is arguably UKIP’s last remaining source of credibility in a party that is beyond toxic and – unlike the majority of his party’s other elected MEPs – is actually known to be a good constituency MP. But the parliamentarian made an indiscretion that UKIP cannot tolerate, a sin so heinous that his immediate expulsion must be arranged. He suggested that voters have issues with the way UKIP conducts itself and in turn, this may have an impact on why people don’t vote for them. In the twisted and dark world of the UK Independence Party this is sacrilege of the highest order. An inquisition must surely be formed – just don’t call the NEC. “We as a party need to ask ourselves “what is it, what is it to do with our values, what is it about us?” that means many people aren’t giving us the benefit of the doubt. That’s a key question, regardless of the outcome of the by-election.” – Douglas Carswell MP’s “disgraceful statement”. It is not the MP’s first run-in with UKIP’s bully boy routine. Last year members of the Young Independence youth movement applauded and cheered when MEP David Coburn declared that “hanging would be too good” for Douglas Carswell at the YI conference. There have also been multiple briefings and attacks against Carswell placed in the media, including a report that “dark forces” within UKIP had attempted to cause problems in the former Tory’s marriage by launching a blackmail plot – apparently as a way of punishing him for supposed crimes against the party. The disgraceful behaviour can only be described as a bullying campaign and it is no wonder the MP refuses to attend party conferences and meetings. Perhaps he is worried about his personal safety, after-all, the last time he attended he was verbally abused by UKIP’s most prolific donor. What makes it all the more shocking is that this campaign is being led and endorsed by UKIP’s elected MEPs, using their media and social media profiles to seek and destroy their man in Westminster; enabling like-minded UKIP supporters and thus expanding the bullying campaign. UKIP MEPs routinely like and re-tweet posts which viciously attack perceived party enemies including Carswell, Suzanne Evans and others, using their profiles as elected members of the European Parliament, not just their private accounts. UKIP’s MEPs routinely use their media and social media reach to attack their solitary MP. It’s is exactly this type of behaviour and culture that led to the shocking scenes in Strasbourg last year when UKIP MEPs Steven Woolfe and Mike Hookem let their fists fly in a vote meeting; a boiling over of internal tension that concluded in Woolfe’s seizure and hospital stay. It was not outside the realms of possibility that he could have died as a result of his injuries. Thank god he did not. The former UKIP MEP was so concerned by bullying and intimidation among parliamentary staff that he instructed one of his aides to “protect himself” and “not take the bullying”. Steven Woolfe acknowledges the bullying culture within UKIP in a text conversation with an aide in December 2015. We have been told of several other alleged violent altercations between UKIP MEPs and /or staff in previous years. Readers will also remember that one of UKIP’s own ethnic minority aides was attacked in his office by the party’s Brussels press chief when he dared to speak up about racism and bullying within the EFDD group. Judging UKIP by their words and actions it is painfully obvious that this type of “altercation” is the rule rather than the exception. Bullying, intimidation violence and the threat of physical force is a way of life within UKIP. This entry was posted on 26/02/2017 at 00:28	and is filed under Hillsborough, Paul Nuttall, UKIP. Tagged: BREXIT, Douglas Carswell, EFDD, Exposing Ukip, GL-W, Greg Lance-Watkins, Greg_L-W, London, Media, UKIP. You can follow any responses to this entry through the RSS 2.0 feed. You can leave a response, or trackback from your own site.